When I began researching Hackers--so many years ago that itâs scary--I thought Iâd largely be chronicling the foibles of a sociologically weird cohort who escaped normal human interaction by retreating to the sterile confines of computers labs. Instead, I discovered a fascinating, funny cohort who wound up transforming human interaction, spreading a culture that affects our views about everything from politics to entertainment to business. 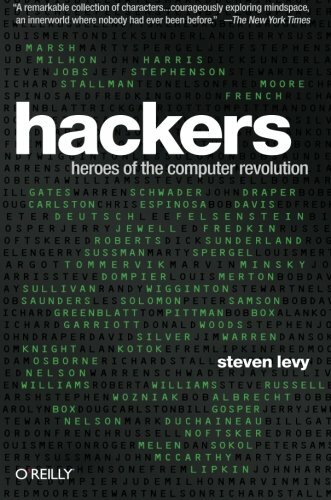 The stories of those amazing people and what they did is the backbone of Hackers: Heroes of the Computer Revolution. But when I revisited the book recently to prepare the 25th Anniversary Edition of my first book, it was clear that I had luckily stumbled on the origin of a computer (and Internet) related controversy that still permeates the digital discussion. Throughout the book I write about something I called The Hacker Ethic, my interpretation of several principles implicitly shared by true hackers, no matter whether they were among the early pioneers from MITâs Tech Model Railroad Club (the Mesopotamia of hacker culture), the hardware hackers of Silicon Valleyâs Homebrew Computer Club (who invented the PC industry), or the slick kid programmers of commercial game software. One of those principles was âInformation Should Be Free.â This wasnât a justification of stealing, but an expression of the yearning to know more so one could hack more. The programs that early MIT hackers wrote for big computers were stored on paper tapes. The hackers would keep the tapes in a drawer by the computer so anyone could run the program, change it, and then cut a new tape for the next person to improve. The idea of ownership was alien. This idea came under stress with the advent of personal computers. The Homebrew Club was made of fanatic engineers, along with a few social activists who were thrilled at the democratic possibilities of PCs. The first home computer they could get their hands on was 1975âs Altair, which came in a kit that required a fairly hairy assembly process. (Its inventor was Ed Roberts, an underappreciated pioneer who died earlier this year.) No software came with it. So it was a big deal when 19-year-old Harvard undergrad Bill Gates and his partner Paul Allen wrote a BASIC computer language for it. The Homebrew people were delighted with Altair BASIC, but unhappy that Gates and Allen charged real money for it. Some Homebrew people felt that their need for it outweighed their ability to pay. And after one of them got hold of a âborrowedâ tape with the program, he showed up at a meeting with a box of copies (because it is so easy to make perfect copies in the digital age), and proceeded to distribute them to anyone who wanted one, gratis. This didnât sit well with Bill Gates, who wrote what was to become a famous âLetter to Hobbyists,â basically accusing them of stealing his property. It was the computer-age equivalent to Luther posting the Ninety-Five Theses on the Castle Church. Gateâs complaints would reverberate well into the Internet age, and variations on the controversy persist. Years later, when another undergrad named Shawn Fanning wrote a program called Napster that kicked off massive piracy of song files over the Internet, we saw a bloodier replay of the flap. Today, issues of cost, copying and control still rage--note Viacomâs continuing lawsuit against YouTube and Google. And in my own businessâjournalism--availability of free news is threatening more traditional, expensive new-gathering. Related issues that also spring from controversies in Hackers are debates over the âwalled gardensâ of Facebook and Appleâs iPad. So Amazon.com readers, itâs up to you. Those who have not read Hackers,, have fun and be amazed at the tales of those who changed the world and had a hell of time doing it. Those who have previously read and loved Hackers, replace your beat-up copies, or the ones you loaned out and never got back, with this beautiful 25th Anniversary Edition from OâReilly with new material about my subsequent visits with Gates, Stallman, and younger hacker figures like Mark Zuckerberg of Facebook. If you donât I may have to buy a scissors--and the next bad haircut could be yours!